Here's a lil timeline of SHAD...!! 2004 - Won the solo male category of the "Rhythm of the Future" unsigned talent contest put on by 91.5FM "The Beat" in Kitchener-Waterloo. Winners were awarded a $17,500 recording prize. 2005 - Released debut album, "When This is Over" - funded with the proceeds from the 'Rhythm of the Future' competition. 2006 - Opened for Common, Lupe Fiasco, Del and others, toured nationally, performed at CMW, NXNE, and other festivals. 2007 - Signed with Black Box Recordings/Fontana North. Performed at Hillside Music Festival, Wakestock, S.C.E.N.E., Cutting Edge, LOLA, and others. Released Sophmore album, "The Old Prince". 2008 - Opened sold-out national tour for Classified. Awarded Juno-nomination for 'Rap Recording of the Year' for "The Old Prince". Headlined Skate4Cancer national tour. Short-listed for Polaris Music Prize. 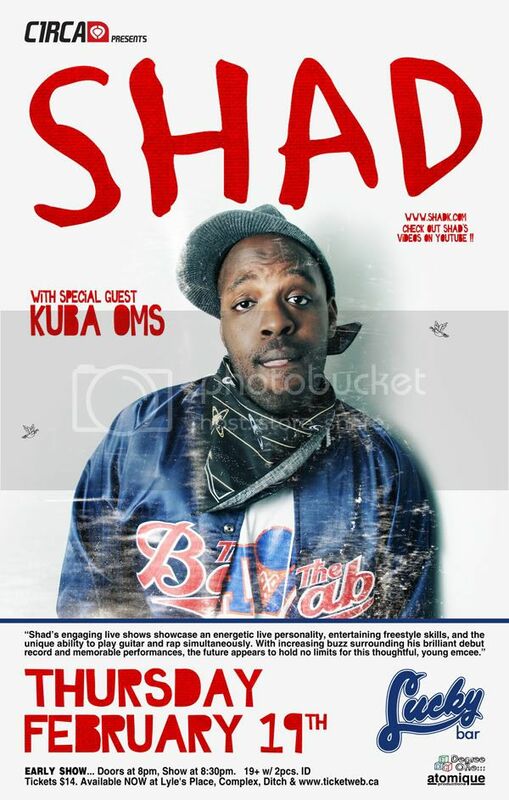 2009 - Shad tours Ontario and BC before hitting The SXSW Festival in Austin, Tx. a Grammy Weekend Industry Showcase in L.A. and then on to 2.5 months on the road all over N. America with The Vans Warped Tour. No Minors. 2 Pieces of ID.